I know I'm hella late with this video, but every time I watch it it just makes me laugh. The President did the damn thing when it defined Romnesia and gave the symptoms to it. It was classic Obama. 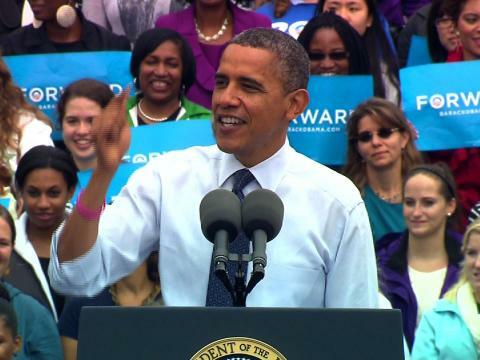 Making a direct gender-pitch in hotly contested Virginia, Obama tells a college crowd that when it comes to issues important to women’s health and jobs, Romney has conveniently overlooked his past stands. Obama, a broad grin on his face, borrowed heavily from the style of comedian Jeff Foxworthy, known for his “you might be a redneck” standup routines. “If you say you’ll protect a woman’s right to choose, but you stand up at a primary debate and said that you’d be ‘delighted’ to sign a law outlawing that right to choose in all cases, man, you’ve definitely got Romnesia,” he said. Obama added, “If he offered you that deal when he was in corporate finance, you wouldn’t give him a dime.” So why, Obama asked, would voters cast their ballots for him. Obama’s message was aimed at suburban women who form a formidable voting bloc in northern Virginia. The president raised once more Romney’s comment during the second debate that he received “binders full of women” when he sought to diversify his cabinet as Massachusetts governor. “You don’t want somebody who needs to ask for binders full of women. You don’t want that guy,” Obama said. But now that we’re 18 days out from the election, Mr. “Severely Conservative” wants you to think he was “severely kidding” about everything he’s said over the last year. He told folks he was “the ideal candidate” for the Tea Party, now suddenly he’s saying, “what, who, me?” He’s forgetting what his own positions are, and he’s betting that you will too. I mean he’s changing up so much – backtracking and sidestepping. We’ve gotta name this condition that he’s going through.. I think it’s called “Romnesia.” That’s what it’s called. I think that’s what he’s going through. Women, men, all of you. These are family issues. These are economic issues. I want my daughters to have the same opportunities as anybody’s sons. I believe America does better, the economy grows more, we create more when everybody participates, when everyone’s getting a fair shot, everybody’s getting a fair shake, everybody’s playing by the same rules, everybody’s doing their fair share. That’s why I’m asking you for another term as President of the United States. I need you to help me finish the job.